Bacterial canker is a destructive disease of kiwifruit caused by the Gram-negative bacterium Pseudomonas syringae pv. actinidiae (Psa). To understand the disease-causing mechanism of Psa, a kiwifruit yeast two-hybrid cDNA library was constructed to identify putative host targets of the Psa Type Three Secreted Effector AvrPto5. In this study, we used the Mate & Plate™ yeast two-hybrid library method for constructing a kiwifruit cDNA library from messenger RNA of young leaves. The constructed library consisted of 2.15 × 106 independent clones with an average insert size of 1.52 kb. The screening of the kiwifruit yeast two-hybrid cDNA library with Psa AvrPto5 revealed the interaction of a V-type proton ATPase subunit-H, a proline rich-protein and heavy metal-associated isoprenylated plant protein 26. Among these, heavy metal-associated isoprenylated plant protein 26 showed a positive interaction with Psa AvrPto5 as both prey and bait. Kiwifruit (Actinidia spp.) is one of the most valuable horticulture crops of the world, generating 2.7 billion USD in 2017 . In recent years, kiwifruit cultivation faced a production constraint when Pseudomonas syringae pv. actinidiae (Psa), a phytopathogenic Gram-negative bacterium responsible for the bacterial canker disease in kiwifruit, caused severe losses worldwide . Five Psa biovars (1, 2, 3, 5 and 6), have been defined based on their place of origin, variation in the accessory genome and the symptoms caused [3–5]. Strains from these five biovars can cause shoot die-back and cankers in trunks; a severe symptom that can lead to the death of the kiwifruit vine. Gram-negative plant and animal bacterial pathogens use a Type Three Secretion System to deliver effectors into the host [6, 7]. Type Three Secreted Effectors (T3SEs) are necessary for pathogen virulence in susceptible plants but, conversely, may induce an immunity-associated hypersensitive reaction in plants harbouring a resistance gene . Several bacterial T3SE proteins can inhibit plant defences ; often, the mechanism behind this inhibition is unclear. The identification and characterization of the host target (s) of the effector may reveal these mechanisms. The comparison of the accessory genomes of biovar 1, 2, 3, 5 and 6 has identified effector genes common to all biovars. From this subset of effectors, Psa avrPto5 (Gene ID IYO_020425) was selected for host target identification in this study. Its homologue from the tomato bacterial speck pathogen Pseudomonas syringae pv. tomato DC3000 (PtoDC3000) avrPto1, has been investigated extensively in tomato and Arabidopsis . A sequential knock-down study of 28 T3SEs in PtoDC3000 and their subsequent re-introduction into the pathogen demonstrated an increase in virulence on N. benthamiana leaves when avrPto1 or avrPtoB was re-introduced . From this, it was postulated that host target identification with avrPto5 could reveal critical components of the Psa virulence mechanism in kiwifruit. To identify host targets, a Y2H system was used, owing to its tractability, the ability to observe an interaction in vivo , and its successful use with identification of host targets for other plant pathogen effectors [13–15]. In this study, an in vivo kiwifruit cDNA library was generated, assessed for its essential criteria, and screened using Psa AvrPto5 as bait. One-month-old ‘Hort16A’ tissue-cultured plantlets were used for total RNA extraction . Total RNA integrity analysis used the Agilent Bioanalyzer 2100 (Agilent Technologies, USA) as per the manufacturer’s protocol. Total RNA samples with a RNA integrity number (RIN) over 7 were utilized for mRNA isolation using a NucleoTrap® mRNA kit (MACHEREY-NAGEL, Germany). Purified mRNA was used for double strand (ds) cDNA synthesis as per the manufacturer’s protocol (Clontech, USA). From ds cDNA synthesis, a 7 µL aliquot was used for gel electrophoresis (0.8% agarose) to verify ds cDNA amplification. CHROMA SPIN TE-400 columns (Clontech, USA) were used for ds cDNA purification. Purified ds cDNA and pGADT7-Rec (Clontech, USA) were co-transformed into prey yeast cells (Y187; Clontech, USA) using the YeastMaker™ yeast transformation system 2 (Clontech, Cat. No. 630439). Four days after plating, transformation efficiency and the number of independent clones were calculated as per the manufacturer’s protocol (Clontech, USA). The library cell density was also determined by haemocytometer counts, and 12 prey clones were randomly selected and analysed for the presence of prey plasmids by plasmid-specific HindIII restriction enzyme digestion and agarose gel electrophoresis. A PCR-based amplification of Psa avrPto5 with Psa genomic DNA and gene-specific primers (see Additional file 1: Table S1) and was ligated into the pCR™8/GW/TOPO® entry vector based on the manufacturer’s protocol (Invitrogen, USA). Psa avrPto5 entry plasmid was used in a Gateway® LR reaction (Invitrogen, USA) with the bait vector (pGBG2)  to develop a bait plasmid containing the avrPto5 insert. Psa AvrPto5 carrying bait yeast cells (Gold Y2H; Clontech, USA) and the prey vector (pGADT7-Rec) harbouring prey yeast cells (Y187) were generated by the YeastMaker™ yeast transformation system 2. The auto-activation and toxicity of the bait were tested based on the manufacturer’s protocol (Invitrogen, USA). A concentrated bait yeast culture (Psa avrPto5) (4 mL) and prey yeast cDNA library (1 mL) were mixed in a sterile 2 L conical flask containing 45 mL 2× YPDA liquid medium and subsequent steps were performed as per the manufacturer’s protocol (Clontech, USA). Mated yeast cells were spread on SDA/-Leu-Trp-His medium and incubated at 30 °C for 5 days. Positively interacting clones appearing on SDA/-Leu-Trp-His medium were suspended in sterile 1× TE buffer at OD600 0.4 value and tested further on a higher stringency SDA/-Leu-Trp-His-Ade medium. Prey plasmids from positively interacting yeast clones were isolated, transformed into E. coli using a plasmid miniprep kit (Zymo Research, USA) and standard electroporation (Bio-Rad, USA) protocols, respectively. Prey plasmids re-isolated from E. coli were re-transformed into prey yeast cells and mating was repeated with the bait (Psa avrPto5) to confirm the interactions. Diploid yeast cells possessing both plasmids and controls at OD600 0.4 value were plated on SDA/-Leu-Trp, SDA/-Leu-Trp-His and four plates of SDA/-Leu-Trp-His supplemented with 1 mM to 4 mM 3-AT (3-Amino triazole), a competitive inhibitor of the histidine. Three kiwifruit proteins identified from the above screen, heavy metal-associated isoprenylated plant protein 26 (AcHIPP26), V-type proton ATPase subunit H (AcATPase) and proline rich-plant protein (AcPRP), were PCR amplified from kiwifruit cDNA with gene-specific primers (see Additional file 1: Table S1) using the kiwifruit database [18–20]. The resulting PCR amplification reaction was analysed by electrophoresis (1% agarose gel), and these genes were cloned into the prey vector (pADG2)  as per the manufacturer’s protocol. Subsequently, these were transformed into prey yeast cells and their interaction analysed with the bait (Psa avrPto5) as described above. Similarly, AcHIPP26 and Psa avrPto5 were generated as bait and prey respectively, to verify their interaction. The kiwifruit gene models referred to are available from the list of FASTA gene models on the Plant and Food Research GitHub Repository (https://github.com/PlantandFoodResearch/Red5_WGS_Manual_Annotation) using the file Acc_all_models_cds.fasta.gz which contains the cDNA sequences for the coding regions. 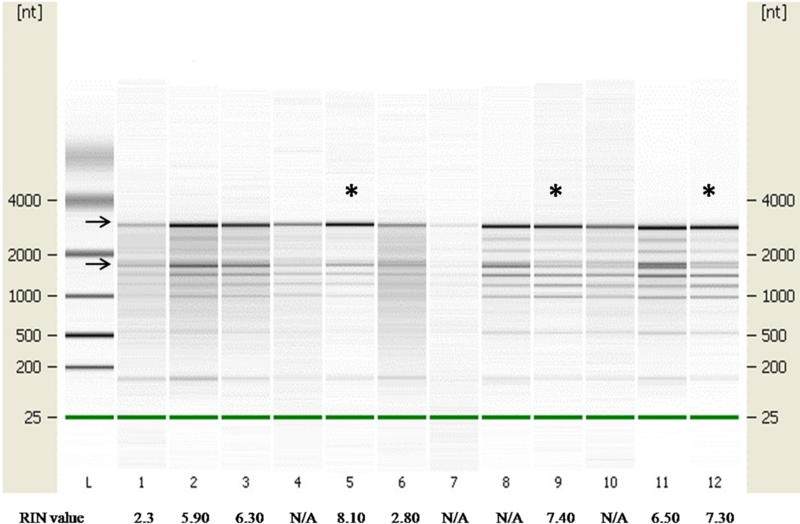 The integrity assessment of kiwifruit total RNA samples in the Bioanalyzer 2100 gave RIN values from 2.3 to 8.1 (Fig. 1). In contrast to animal RNA, plant RNA has characteristic 25S and 18S rRNA units, and chloroplast RNA. In this experiment, an older version of the Bioanalyzer was used which examines RNA integrity from animal tissues , the characteristic features of plant RNA might interfere with RIN value calculation, making RIN measurement inaccurate. This means rRNA peaks in the electropherogram should be visually examined . The visual assessment of the electropherogram (see Additional file 1: Figure S1) revealed no sign of the reduction in signal magnitudes in RNA samples, indicating kiwifruit total RNA was intact. In this experiment, kiwifruit mRNA was reverse transcribed by using the SMART™ cDNA synthesis method (Clontech, USA). While verifying ds cDNA in gel electrophoresis, a cDNA smear appeared between 0.4 and 3 kb, with greatest intensity between 0.4 and 2 kb (see Additional file 1: Figure S2). This suggests kiwifruit ds cDNA with a broad range of sizes was present with suitable parameters for library generation. The kiwifruit cDNA library was constructed by co-transforming ds cDNA and pGADT7-Rec vector into prey yeast cells. The transformation efficiency of the library was 7.1 × 105 CFU/µg prey vector and the total number of independent clones was calculated as 2.15 × 106 CFU/library. These findings are comparable with a study where a cDNA library generation from vernalized winter wheat in yeast using the SMART™ method showed a transformation efficiency of 5.25 × 105 CFU/µg prey vector and a total number of independent clones of 2.52 × 106 CFU/library . This suggested optimal condition for the kiwifruit library construction. The library titre assessment by haemocytometer revealed the presence of > 1.8 × 107 CFU/mL. A titre of above 1x107 CFU/mL is recommended for a Y2H library (Clontech, USA). The assessment of the cDNA insert size in prey plasmids by restriction digestion demonstrated the presence of inserts in all prey plasmids (not shown). The shortest and longest cDNA insert sizes were 0.65 kb and 2.8 kb respectively, and the average cDNA insert size of the library was 1.52 kb. A candidate Y2H assay had been performed using Pto AvrPto host targets (AtCERK, AtLysm, AtTIFY6B, AtTCP) . Their kiwifruit orthologs were tested with Psa AvrPto5 in Y2H however none interacted . Therefore, we chose to screen the kiwifruit cDNA library with Psa AvrPto5. Before initiating Y2H screening, the Psa avrPto5 clone was investigated for toxicity and auto-activation of the histidine marker in yeast. This showed no toxicity and auto-activation of the histidine marker on SDA/-Leu-Trp-His medium (see Additional file 2: Figures S3, S4). As a result, the medium SDA/-Leu-Trp-His could be employed as a minimal medium to monitor Psa AvrPto5 interactions. After screening the library, 53 positive interactions were identified. The prey plasmids were first isolated from all positive yeast colonies, re-transformed into prey yeast cells and re-analyzed for the interaction characteristics. These assays revealed three prey clones having positive interactions with Psa AvrPto5 (see Additional file 3: Figure S5). These were identified, by sequencing the plasmid, as AcHIPP26, AcATPase and AcPRP (Table 1). Most of the false positives were eliminated at the first instance using SDA-Leu-Trp-His medium. The sequencing of these false positives revealed they coded for actinidin, ACC oxidase, pyruvate decarboxylase and hypothetical proteins. An reverse transcription PCR amplified full-length copy of AcATPase, AcPRP and AcHIPP26 genes was used again to verify the interaction with the bait and AcATPase, AcPRP proteins did not interact (see Additional file 3: Figure S6). The full-length copy of AcHIPP26 interacted with Psa AvrPto5 as prey (Fig. 2) and bait (see Additional file 3: Figure S7). This indicates a true interaction between the two proteins in yeast. The AcHIPP26 is a putative metallo-chaperone protein based on alignments of its protein sequence with that of HIPP26 proteins from other plant species; it has a heavy metal-associated domain (HMA) and a C-terminus isoprenylation motif (CaaX) . Several strands of evidence indicate that heavy metal-associated proteins participate in significant ways in plant-pathogen interactions [26, 27]. For example, the virulence of Xoo (Xanthomonas oryzae pv. oryzae) effector PthXo1 involves eliminating copper ions in rice by manipulating the Xa21-induced COPT1 and COPT5 metallo-chaperones to encourage pathogen proliferation . The small HMA (sHMA) proteins are the virulence target of the M. oryzae effector AVR-Pik in rice  and the HMA domain also has a role as a host target mimic in the Pikp-1 rice resistance protein to trigger pathogen defence . These examples suggest that the metallo-chaperones may have an important role in plant defence or other roles that the pathogen needs to manipulate and hence be a target for effectors. Our finding of AcHIPP26 as a possible host target of Psa AvrPto5 adds extra weight to this hypothesis. In this experiment, we identified more than fifty positive interactions with the bait. From a biological perspective, such a large number of interactions may not reflect the likely interaction in planta. Subsequent analyses of many of these interactions revealed them as likely false positives. We observed that partial length proteins of AcATPase and AcPRP interacted strongly, however, the full length of these proteins did not interact with Psa AvrPto5. This discrepancy can be explained in a number of ways including false-positive interactions or an indication that domain interactions can be prevented by steric hindrance caused by the folding of other portions of the protein . Sometimes such folding changes can be biologically relevant and at other times may be artefacts. Therefore, it is essential to be aware of the Y2H system disadvantages so that the technique can be employed in an effective way to accomplish its experimental aims. While the AcHIPP26 protein, in particular, is a potential candidate target for Psa AvrPto5, the interactions identified in this analysis need to be verified by further research in planta to assess their biological relevance. KD, EHAR MDT conceived of and designed the experiments. KD and WC carried out the experiments and generated the data. KD, EHAR WC MDT analyzed the data. KD, EHAR MDT wrote the paper. All authors read and approved the final manuscript. We would like to thank Kee H. Sohn and Minsoo Yoon for kindly providing Pgy AvrB and AtRIN4 constructs, respectively. We also thank Joanna K. Bowen and Jay Jayaraman for proofreading the manuscript. Materials used in this study are available upon request. This work was funded by a grant from the New Zealand Ministry for Business, Innovation and Employment (C11X1205). KD was a recipient of a University of Auckland Doctoral Scholarship. The funding bodies had no role in the experimental design of the study, the collection, analysis and interpretation of data, or the writing of the manuscript. 13104_2019_4102_MOESM1_ESM.docx Additional file 1: Figure S1. Electropherogram of kiwifruit total RNA samples. The visual assessment showed the presence of prominent 25S and 18S rRNA peaks on RNA samples 2, 3, 5, 8, 9, 11 and 12. *** corresponds to three chloroplast RNA peaks . Some pictures are not marked with *** because the chloroplast peaks are not prominent enough. Figure S2. Gel electrophoresis of kiwifruit ds cDNA synthesis. Lane L—Kb plus ladder (Invitrogen, Cat. No. 10787018); Lanes 1, 2—Kiwifruit ds cDNA; Lane 3—Mouse liver ds cDNA. Table S1. Gene specific primers used in this study. 13104_2019_4102_MOESM2_ESM.docx Additional file 2: Figure S3. The bait (Psa AvrPto5) toxicity assay. A—Yeast cells expressing empty bait vector on SDA/-Trp medium; B—Yeast cells expressing bait (Psa AvrPto5) on SDA/-Trp medium. Figure S4. The bait (Psa AvrPto5) auto-activation assay. I—SDA/-Leu-Trp medium; II—SDA/-Leu-Trp-His medium. 1—Positive interaction control (Murine p53 (bait) + SV40 large T-antigen (prey); Clontech, USA); 2—Negative interaction control (Lamin (bait) + SV40 large T-antigen (prey); Clontech, USA); 3—Negative self-activation control (Empty bait and prey vectors); 4—True positive interaction control  (Pgy AvrB (bait) + AtRIN4 (prey)); 5—Psa AvrPto5 (bait) and Empty prey vector. 13104_2019_4102_MOESM3_ESM.docx Additional file 3: Figure S5. Y2H analysis of Psa AvrPto5 and three prey clones. Plates I—SDA/-Leu-Trp medium; Plate II—SDA/-Leu-Trp-His medium; 1—Positive interaction control (Murine p53 (bait) + SV40 large T-antigen (prey); Clontech, USA); 2—Negative interaction control (Lamin (bait) + SV40 large T-antigen (prey); Clontech, USA); 3—Negative self-activation control (Empty bait and prey vectors); 4—Bait self-activation control (Psa AvrPto5 (bait) + empty prey vector); 5—True positive interaction control  (Pgy AvrB (bait) + AtRIN4 (prey)); 6—Prey self-activation control (Empty bait vector + AcATPase (prey)); 7—Psa AvrPto5 (bait) + AcATPase (prey); 8—Prey self-activation control (Empty bait vector + AcHIPP26 (prey)); 9—Psa AvrPto5 (bait) + AcHIPP26 (prey); 10—Prey self-activation control (Empty bait vector + AcPRP (prey)); 11—Psa AvrPto5 (bait) + AcPRP (prey). Figure S6. Y2H analysis of Psa AvrPto5 (bait) and full length AcATPase, AcPRP proteins. Plate I—SDA/-Leu-Trp medium; Plate II—SDA/-Leu-Trp-His medium. 1—Positive interaction control (Murine p53 (bait) + SV40 large T-antigen (prey); Clontech, USA); 2—Negative interaction control (Lamin (bait) + SV40 large T-antigen (prey); Clontech, USA); 3—Negative self-activation control (Empty bait and prey vectors); 4—Bait self-activation control (Psa AvrPto5 (bait) + Empty prey vector); 5—True positive interaction control  (Pgy AvrB (bait) + AtRIN4 (prey)); 6—Prey self-activation control (Empty bait vector + AcATPase (prey)); 7—Psa AvrPto5 (bait) + AcATPase (prey); 8—Prey self-activation control (Empty bait vector + AcPRP (prey)); 9—Psa AvrPto5 (bait) + AcPRP (prey). Figure S7. Y2H analysis of AcHIPP26 (bait) and Psa AvrPto5 (prey). Plate I—SDA/-Leu-Trp medium; Plate II—SDA/-Leu-Trp-His + 3-AT 4 mM medium; 1—Positive interaction control (Murine p53 (bait) + SV40 large T-antigen (prey); Clontech, USA); 2—Negative interaction control (Lamin (bait) + SV40 large T-antigen (prey); Clontech, USA); 3—Negative self-activation control (Empty bait and prey vectors); 4—True positive interaction control  (Pgy AvrB (bait) + AtRIN4 (prey)); 5—Bait self-activation control (AcHIPP26 (bait) + empty prey vector); 6—Prey self-activation control (Empty bait vector + Psa AvrPto5 (prey)); 7—AcHIPP26 (bait) + Psa AvrPto5 (prey). Workman D. Kiwifruit exports by country. 2018. http://www.worldstopexports.com/kiwifruit-exports-by-country. Accessed 25 Oct 2018. Dharmaraj, K. Functional characterization of Pseudomonas syringae pv. actinidiae effectors AvrPto5 and HopF2 (Doctoral thesis, University of Auckland, New Zealand). 2018. https://researchspace.auckland.ac.nz/handle/2292/37565. Accessed 21 Dec 2018. Kanzaki H, Saitoh H, Cesari S, Fujisaki K, Kanzaki E, Yoshida K, et al. Heavy metal-associated domain (HMA) proteins of rice confer susceptibility to Magnaporthe oryzae and are targeted by M. oryzae effector AVR-Pik. https://www.ismpmi.org/congress/2016/abstracts/pages/abstractdetail.aspx?LID=191. Accessed 23 June 2018. Krupp G. Stringent RNA quality control using the Agilent 2100 bioanalyzer. In: Agilent Technologies Application Notes. 2005. http://citeseerx.ist.psu.edu/viewdoc/download?doi=10.1.1.493.5004&rep=rep1&type=pdf. Accessed 19 July 2018.